Don’t worry. Baseball preview season is almost over, which means that we’ll be back to normal soon enough (and, hopefully, I will be able to go to bed before 4:00 AM every night-slash-morning). 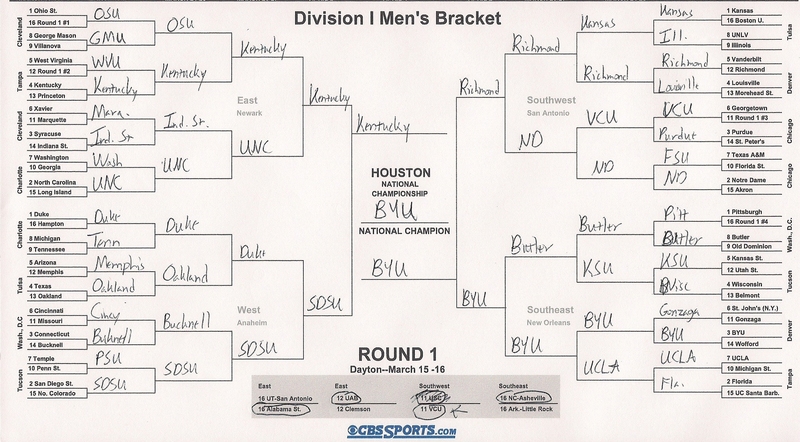 In the meantime, enjoy this look at the NCAA Tournament brackets of a man who follows college basketball only slightly more closely than he follows The Bachelor. You’ll notice that the approach here is pretty conventional. Basically, I select the teams that, to my largely-uneducated mind, seem like the best bets to win. That usually means fewer upsets and “safer” picks. * That’s certainly the case here, with the Kansas Jayhawks winning the title. But . . . I have two teams from the same conference playing each other for the title. That seems fairly unlikely. And all the “experts” are saying that this has been a crappy year for college basketball with no great teams or players, so the tournament will probably have a lot of upsets. 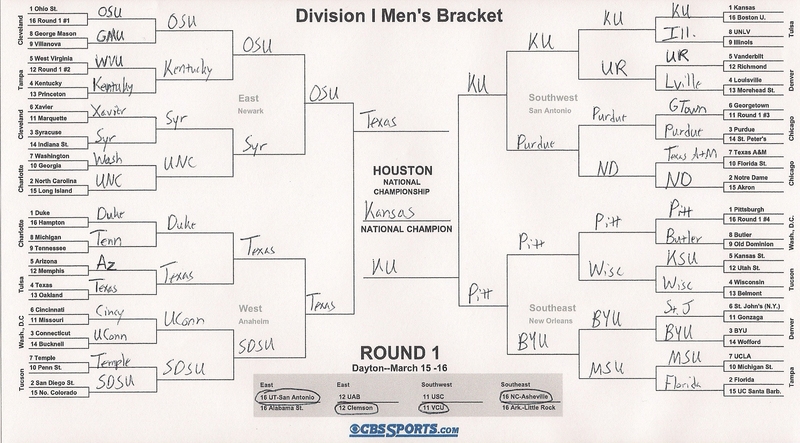 This is the “Alternate” bracket. I also do one of these each year. This could also be called a “hedge” or “CYA” bracket. 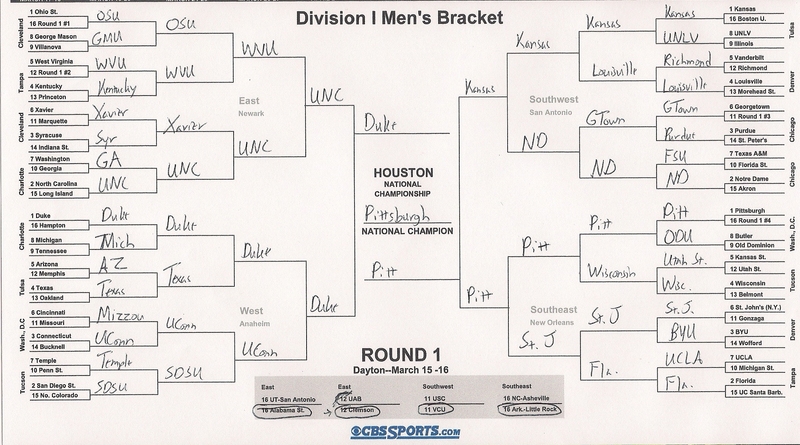 This bracket is normally less successful than my still-not-good-enough-to-win Orthodox bracket. The theory is that I protect my primary bracket by having a second bracket with a different, but also reasonable, outcome. But haven’t I neglected the unreasonable outcomes? I’m so glad you asked! While the other two brackets could be considered plausible attempts at having fun while trying to win money (akin to playing the lottery), this bracket is undeniably the equivalent of passing a few small bills through a paper shredder. Part fantasy, part delusion, all nonsense, this bracket is known as “Crazy,” and is normally eliminated from any monetary considerations by about four o’clock Friday. The only time I’ve ever won a big NCAA pool was my senior year** of high school, when I played two brackets and one of them came through thanks to Kentucky’s win over Syracuse. Naturally, since I was also the one holding all the entries during the tournament, I was immediately accused of cheating by some of my insecure classmates. But I digress. So, I continue to waste not one, not two, but three entry fees each year by implementing this two-prongs-too-many three-pronged attack. Refer back to this post throughout the next couple of weeks if you need to feel better about your own pathetic NCAA Tournament showing. *I used to produce four brackets per year, with the other being a “No Upsets” bracket. I decided it was stupid to do this once I realized that my primary bracket was beginning to look almost indistinguishable from the No Upsets version. **Of course I peaked in high school. Duh. This entry was posted in Commentary, Sports and tagged Basketball, Commentary, Gambling, Jimmer Fredette, March Madness, NCAA, NCAA Tournament, Sports, Throwing Money Away, Tournament Pool. Bookmark the permalink.